Kal Penn, who plays the sensitive, emotionally fragile son of immigrant parents in Mira Nair's The Namesake might not have paid the customary 10 percent (finder's fee) to Zohran Mamdani, 14 and his friend Sam Walker, 15. But he doesn't hesitate to mention that he owes his part in the film to the teenagers. He said so at the New York premiere of the film on the opening day of the sixth Indo-American Arts Council Film Festival on Nov 1. The event kicked off with author Salman Rushdie telling the audiences in his inaugural address how much he loved Jhumpa Lahiri's bestseller, and how strongly he felt that Nair was the best person to make a film out of it. Penn, recently seen in the blockbuster Superman Returns, recalled reading The Namesake over two years ago. He was so impressed with it, that he thought of buying the movie rights, said Penn, of course wanting to play the lead -- but Nair had beaten him to it. He then began writing to her asking to be auditioned. Unknown to him, Nair had started casting the film but hadn't yet found the title character: Gogol Ganguli, the American-born son of immigrants who wants to fit in among his fellow Bostonians, while his parents are unwilling to let go of their traditional ways. The screening was one of the best-attended Indian events in New York in recent months. 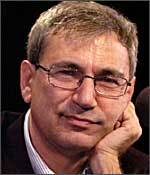 Attendees included newly minted Booker Prize winner Kiran Desai, who rushed out of the theater to meet with the newest Nobel Prize winning novelist Orhan Pamuk (right). 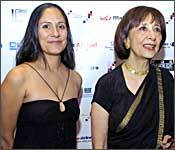 The veteran actress Madhur Jaffrey, whose film Hiding Divya is the centerpiece of the festival, brought along her actress daughter Sakina (left, with Madhur). Jhumpa Lahiri could not attend the premiere because of a literary commitment she had made over a year ago, Nair said. But she sent her greetings, reminding the audience that she is like the book's Ashima Ganguli (Tabu, in the film) and would be there in spirit. Peter Herbst, the editor-in-chief of Premiere magazine, confessed during the post-screening discussion that he had cried the first time he saw the film. And he cried even more when he saw it again. 'But you must have laughed a lot, too,' said Nair bringing up the film's funnier side. Herbst thought the novel by Jhumpa Lahiri it was 'unfilmable,' given its episodic nature. How did Nair get the idea to make a film out the bestseller, he wanted to know. Nair recalled reading the book, which deals with cultural confusion, immigrant choices, and loss, bereavement and redemption, aboard the plane she had taken to India to film the finale of the film Vanity Fair. Though she had bought the book many months before her trip, she read it the first time on the plane journey. She was going through a terrible time then, she confessed, having lost Ammi, her mother-in-law who was visiting them in New York. 'She died in a botched up surgery,' Nair said. When she read the novel, Nair felt Lahiri was writing about many things including bereavement that Nair was feeling right then. She immediately felt she must have the rights to the book. She knew Lahiri and about five years ago she had discussed with the writer the possibility of filming one of the stories in her Pulitzer Prize winning 1999 collection, Interpreter of Maladies. During the later discussion, 'the fact that I had also lived in Kolkata and knew of Bengali culture' helped get the rights to the novel, Nair said. 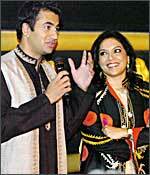 Though Tabu and Irrfan Khan, who plays her immigrant husband in the film The Namesake, were not there at the festival, Kal Penn made up for their absence. He was mobbed by teenage girls, and the young men wanted to know when the sequel to the raunchy comedy Harold and Kumar Go to White Castle will be out. The film, evidently raunchier than the first one, is called Harold and Kumar Go to Amsterdam, and is expected to hit theaters in fall 2007. The executive director of the Indo-American Arts Council, Aroon Shivdasani, thanked the participants who had flown in from India and Hollywood even though the organisation could not afford to pay them for first class airfare or hotel suites. And for the volunteers, many of who have been with IAAC since its inception, had put in free labour. Salman Rushdie, (right, with wife Padma Lakshmi) who gave the brief inaugural speech at the 6th edition of the festival, said the number 6 in India is connected with child labour. 'No surprise you are working free for the festival,' he told the volunteers. Rushdie also reminded the audience that some of the biggest film festivals today, including the ones in Cannes and Venice, had started in a small way. They were often the vision of one person, he said.